I’ve just finished writing up the annual NZ Veterinary Association conference, which was held in Hamilton last month. With nearly 1,000 vets, technicians, nurses and various industry people bustling around the massive Claudelands Events Centre for the week and up to five streams running simultaneously it’s a pretty daunting but exhilarating exercise. The best you can do is cherry pick the most interesting looking events and pray you don’t misrepresent them in print (the reports go into their professional magazine). I have a BA in Geography, which is about as far from veterinary science as you can get, so the more technical stuff can be challenging. That said, most vets take a kindly approach when I’m wrestling with the finer points of small animal orthopaedics or the complexities of antimicrobial resistance. They probably cut me more slack than they would one of their colleagues. I’ve always felt an affinity with vets, enjoy their company and find their work genuinely interesting – so when the opportunity to write for and edit their magazine came up a few years ago I didn’t muck about. These people are high achieving, compassionate, engaging, funny and incredibly hard working. They are also practising scientists, something that’s often overlooked. If you think they must be a watered down version of people who work in human medicine, think again. The basic degree is five years and that usually follows preliminary study just to be considered. And not only can their patients not talk back, they’re dealing with multiple species – everything from sick budgerigars to stud bulls. On top of that they’re dealing with owners, something that requires a whole separate set of skills. And of course they’re working in a completely unsubsidised sector – there is no social welfare for your cat. Some heart-breaking decisions are sometimes needed about whether or not a loved pet can be saved, something that can be as stressful for the vet as it is for the owner. That said, some owners of companion animals are prepared to spend eye-watering amounts to keep their pets alive and happy for a little longer. 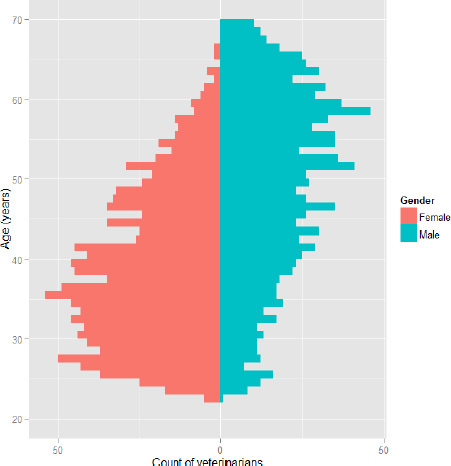 Population pyramid comparing counts of female and male veterinarians in single year age groupings in 2013. Source: The New Zealand Veterinary Workforce in 2012–2013, Veterinary Council of New Zealand. There are interesting demographic changes going on in the profession, something that is probably being reflected in human medicine, the law and other professions. Traditionally, vets were rural and male, working in small, isolated practices. Small animal medicine is a relatively recent phenomenon – it was agriculture that kick started veterinary science in this country. These days the profession is about 50:50 male and female, but one look at this Veterinary Council population pyramid will show you that the “pink tsunami” in the profession is gathering pace. Up to about 80 percent of each graduating class is now female and it won’t be too many years before the “male bulge” exits the profession into retirement and men become a minority. One session during the conference was dedicated to several women in their thirties – dairy vets – who calmly explained how they juggled work, pregnancies, children and the demands of a family farm. They all had supportive employers and families but they all admitted it was tough. They were an inspiration and their stories emphasised how much we need to change our thinking about supporting highly trained young professionals like these through a tough few years. The current government has grudgingly conceded a small increase in paid parental leave, but it’s not enough. 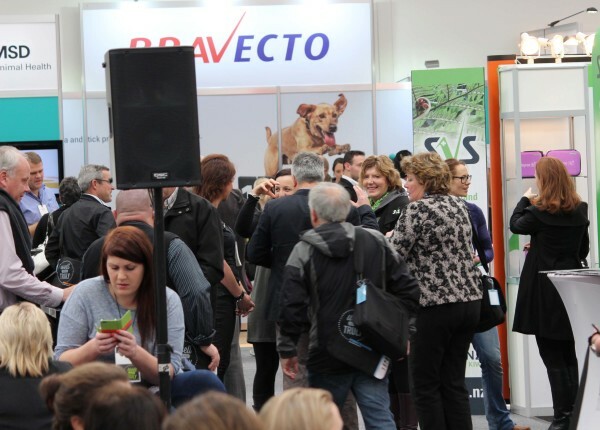 The theme of the conference this year was “Well & Truly”, focusing on wellness among vets as well as their patients. For all their incredible skills and work ethic, vets are also vulnerable to huge amounts of stress, often because they set such high standards for themselves. Sadly, suicide rates among vets are amongst the highest for the various professions. Several guests spoke eloquently on stress and depression, none moreso that Sir John Kirwan. It was clear from the heartfelt feedback during his hour-long presentation, that he’d touched many of those there with his honesty and courage. So, vets then. They’re pretty damned neat people but they’re also human. Give one a hug next time you get the chance.